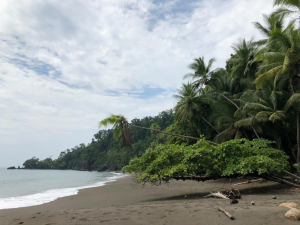 While recently trekking through Costa Rica, we made our way down to the beautiful Osa Peninsula and the Corcovado National Park. Up to that point we had been witness to all sorts of Costa Rica’s wonderful critters, from Resplendent quetzals, kinkajous, olingos and Keel-billed toucans up in the cloud forest region, to Spectacled caiman, Three-toed sloths, Montezuma oropendola, Basilisks and Spider monkeys in the steamy Caribbean coast of Tortuguero. Heading to Corcovado, I was still holding out hope to see a Baird’s tapir, and or course the jungle’s rock star, the Jaguar. Corcovado National Park is an amazing place, and there was no lacking in great wildlife sightings. Still, the tapir and El Jefe were not to be found. The day before I left, I headed down from our lodge to the nearby beach, to head out to Caño Island, just off the coast. About to cross a stretch of grass off the beach, the naturalist, Manfred, stopped me, and pointed out to under a guava tree. At first I thought I was just viewing another yellow-headed caracara, this time perched on a rock. 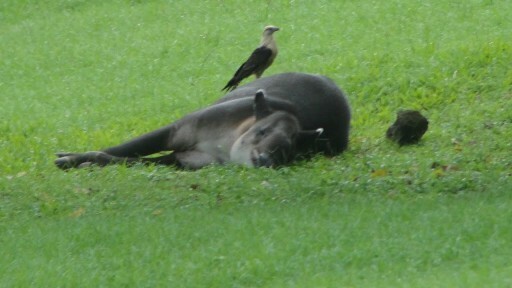 Except it wasn’t a rock, but a relaxing Baird’s tapir, stretched out on the lawn as the caracara hopped about the large animal, nibbling on some sort of parasites or skin. 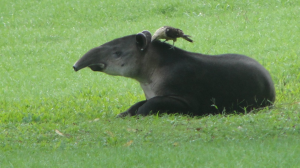 We watched for a good half-hour, with the tapir occasionally rising to its feet to graze or just plod about, the caracara all the while standing on his back or just nearby. Watching the caracara moving around on the tapir and “grooming” the big critter was something else – it struck me as really unusual. Upon my return to the USA, I ran an internet search on this type of symbiotic behavior. Sure enough, I got a hit on a recent paper published by Tulane biologist, Jennifer Coulson, with the pretty much right on target title “Yellow-headed Caracara and Black Vulture Cleaning Baird’s Tapir”. Needless to say, I feel privileged to have witnessed this interesting behavior. You can access Jennifer Coulson’s excellent research here. And Costa Rica really is gorgeous.